Please read a message and view the picture that was shared with us today. This post could be viewed as a part of a series, with a prequel at the end of this post on how the IBC Network Foundation began. Update: Sheryl passed away on March 28th, 2016 at the age of 52. Sheryl, hiking in New Mexico. I grew up camping and hiking and loving that lifestyle. As an adult, these activities have been curtailed until just recently, for various reasons. One of the biggest reasons being my Oct. 2002 diagnosis of stage4 Inflammatory Breast Cancer. My great hope through the past almost dozen years of chemo, surgery, gallons more chemo cocktails, radiation, and even more chemo… has been the hope for improved targeted treatment options, more time with my husband and children, and a return to being able to do the things I love. 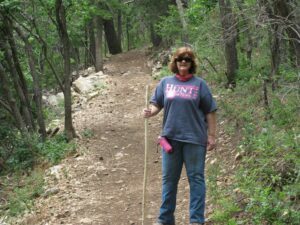 Here I am~ on the trail again, searching for and finding HOPE as I am currently 11 months from my last chemo dose, and doing very well. As I hike, I think about and pray for my beautiful IBC Sister Chicks, with HOPE that you will all have opportunity to pursue and Hunt for Hope® as well!! So you ask, what is the backstory? Sheryl was diagnosed stage 4 IBC in 2002. At the time of Terry Arnold, our founder’s diagnosis, she and Sheryl only lived only a half a mile from each other. Causal friends for years, Terry saw Sheryl battle breast cancer, witnessed her being in and out of treatment, but there was one thing Terry didn’t know… the type of breast cancer. Then in the summer of 2007 Sheryl heard of Terry’s diagnosed and came to visit to offer support. Then these two casual friends became sisters. One reason Terry had hope was to know that Sheryl was able to live with metastatic inflammatory breast cancer for five years past her original diagnosis, and now, many years beyond. Sheryl is stable, currently not in treatment and is living a life long dream of hiking and visiting New Mexico with her husband. This is hope. Also Sheryl and Terry are not convinced IBC is rare… only one half a mile was the distance from their homes. Rare? We don’t think so, just undertracked. Not only was Sheryl a tremendous personal source of inspiration for Terry, she educated her on the need for research, the huge gap in education, both the lay community as well as in the medical community and the need for research funding. This woman is one of the reasons we started The IBC Network Foundation. Thank you Sheryl, your husband Nick, and your family. Hope lives in your story. Please tell someone about IBC. We need research. We need it now.